Test2 | Redline Motorsports inc. Fully Terminated Harness. Designed for single plane style EFI intake manifolds and Holley MPFI intakes. Designed for 24x crank and 1x rear mount cam sensor. Connects to factory coil harnesses and all factory sensors. Designed for 58x crank and 4x front mount cam sensor. Connects to factory coil harnesses and all factory sensors. This wiring harness interfaces a Holley EFI ECU to a 2V or 4V Ford Modular engine. It is meant to be used in conjunction with an injector harness, a coil harness 556-112 (for Holley Smart Coils), or (factory GM harness when using LS Coils) Most stock sensors are used with this harness. There are two optional connectors for interfacing with CAN based Holley modules. There are some loose leads for grounds and power connections. Picture represents 558-108, new product 12/15/15, picture will be updated when available. This wiring harness interfaces a Holley EFI ECU to a Ford Coyote engine that has had the cam VVT hardware locked out. It is meant to be used in conjunction with an injector harness, a Holley Smart coil harness 558-312 (for use with 556-112 Holley Smart Coils) or a GM LS Ignition Harness for LS Coils. Most stock sensors are used with this harness. There are two optional connectors for interfacing with CAN based Holley modules. There are some loose leads for grounds and power connections. This is the main EFI Harness that connects to all of the necessary factory sensors and related EFI sensors to run a Holley EFI system. There is an Early Gen III as well as a Late Gen III harness. The main difference between the early and late harnesses is within the connector for the crank and cam sensors. These changes were implemented across the truck and passenger car lines around 2007. There is not a firm change-over date. 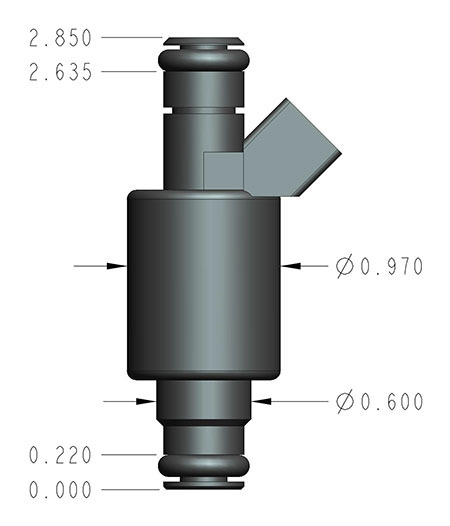 View the image gallery to determine the type of crank and cam sensors you have. Requires the HEMI injector harness, drive-by-wire harness and coil adapter harness. The HEMI’s Variable Valve Timing is not supported by the Holley EFI systems at this time. You can run an engine that is equipped with VVT, but the cam timing will revert to the mechanical default. The Holley R&D team is working on an accessory harness that will drive the VVT actuator. However, it is not available at this time. The HEMI’s Multi-Displacement System (MDS) was primarily designed for fuel economy purposes and does not need to be connected when switching to a Holley EFI system. NOTE: Not legal for sale or use on pollution controlled vehicles. 15' harness length. Fully terminated and populated at ECU connections only. User must terminate all sensor ends. Includes a variety of sensor connections and pins but end user may have to supply sensor pins and connections suited for their specific application. note:Requires MAP Sensor P/N 538-24 Designed to be used with Holley EFI Smart Coil Kit: 556-127 or 556-128 Or Holley EFI Smart Coil Harness: 558-312 or 558-318 and Holley EFI HP Smart Coils - 556-112 When utilizing this Harness with Ti-VCT applications the following parts are required: 554-145 Coyote Ti-VCT Controller, and supporting Harnesses. The HEMI’s Variable Valve Timing is not supported by the Holley EFI systems at this time. You can run an engine that is equipped with VVT, but the cam timing will revert to the mechanical default. The Holley R&D team is working on an accessory harness that will drive the VVT actuator. However, it is not available at this time. The HEMI’s Multi-Displacement System (MDS) was primarily designed for fuel economy purposes and does not need to be connected when switching to a Holley EFI system. NOTE: Not legal for sale or use on pollution controlled vehicles. HEI IGN HARNESS - Connects a small cap HEI Distributor similar to MSD Part # 8366 to the Holley Dominator or HP EFI System. See Distributor Picture below. Designed to be used with the 87-93 HO style Ford TFI Distributor similar to picture below. This harness is meant for a magnetic crank pickup only. We do NOT recommend using magnetic sensors whenever possible, they do not generate clean signals to the Holley EFI, they are easily interrupted with Electromagnetic Interference (EMI). Golden Rule: These are plug-and-play harnesses. If they don’t plug, don’t play. Only the 0459 1847 factory drive-by-wire throttle body has been pre-calibrated and approved for use with these harnesses. Includes J2B ECU Connector. Includes all output connection wires (qty 16). ECU pins are pre crimped. Includes J3 ECU connector. Includes all input and Output Connection Wires (qty 17). ECU pins are pre-crimped. Includes J4 ECU connector. Includes all input and output connection wires (qty 26). ECU pins are pre-crimped. Redline Motorsports offers a Loose J4 connector for the Dominator ECU. Not previously available as an individual part. The J4 connector allows for auxiliary components to be added using the Holley I/O Configuration File. Redline Motorsports offers a Loose J3 connector for the Dominator ECU. Not previously available as an individual part. The J3 connector allows for auxiliary components to be added using the Holley I/O Configuration File. Redline Motorsports offers a loose replacement J2A Connector. If you need to add a second wide band and want to use your own wire or you just need to replace a damaged J2A, Redline has your part. Redline Motorsports offers a loose replacement J2B. We have all of the hard to find individual Holley style connectors. Our J2B gives you the option of adding Meth Injection or additional injectors when needed. Redline Motorsports loose ECU PIN KIT is available in 10 pin packages. The perfect accessory for your J connectors so you can finish that wiring job. Holley EFI 220 lb/hr Fuel Injectors feature a precision lapped disc valve, high-quality brass windings, and high-temp O-rings. These injectors provide excellent linearity with no discernible "bounce" at low pulse widths as commonly found in other injectors. The Holley EFI Fuel Injectors provide precision fuel delivery you can depend on. THIS IS A KIT PUT TOGETHER BY REDLINE MOTORSPORTS INCLUDING THE CORRECT FUEL PUMP, REGULATOR AND PRE AND POST FILTER FOR APPLICATIONS UP TO 900 HP NATURALY ASPIRATED OR 500 HP BOOSTED ON GASOLINE. Kit does not come with lines or fittings. Pump weighs only 3.1 lbs. THIS IS A KIT PUT TOGETHER BY REDLINE MOTORSPORTS INCLUDING THE CORRECT FUEL PUMP, EFI REGULATOR, PRE AND POST FILTERS FOR APLLICATIONS UP TO 1200 HP NATURALLY ASPIRATED OR 650 HP BOOSTED ON GASOLINE. THIS IS A KIT PUT TOGETHER BY REDLINE MOTORSPORTS INCLUDING THE CORRECT FUEL PUMP, EFI REGULATOR, PRE AND POST FILTERS FOR APLLICATIONS UP TO 1200 HP NATURALLY ASPIRATED OR 600 HP BOOSTED ON GASOLINE. THIS IS A KIT PUT TOGETHER BY REDLINE MOTORSPORTS INCLUDING THE CORRECT FUEL PUMP, EFI REGULATOR, PRE AND POST FILTERS FOR APLLICATIONS UP TO 1600 HP NATURALLY ASPIRATED OR 950 HP BOOSTED ON GASOLINE. Capable of 130 PSI while providing significant flow for forced induction applications where belt driven pumps are normally used. Unlike other pumps, the VR Series are built for continuous duty if needed. THIS IS A KIT PUT TOGETHER BY REDLINE MOTORSPORTS INCLUDING THE CORRECT FUEL PUMP, EFI REGULATOR, PRE AND POST FILTERS FOR APLLICATIONS UP TO 3200 HP NATURALLY ASPIRATED OR 1900 HP BOOSTED ON GASOLINE.